The case is closed: Editorial bias prevents reasonable evaluation of dietary supplements! Being involved with dietary supplement research for almost 18 years, I have witnessed my share of hype for, and against, the use of dietary supplements. Few, however have attempted such blatant finality to the subject as the recent editorial in the Annals of Internal Medicine– titled “Enough is Enough: Stop wasting money on vitamin and mineral supplements.” The editorial, coupled with the publication of three papers in the same issue, declares in no uncertain terms that “..we believe the case is closed-supplementing the diet of well-nourished adults with (most) mineral or vitamin supplements has no clear benefit and might even be harmful. These vitamins should not be used for chronic disease prevention. Enough is enough.” The publication of the editorial was hyped by many news outlets who quickly found the usual supplement bashers, all too willing to add insult to injury by regurgitating decades-old sound-bites. Anybody that has spent even a brief amount of time evaluating medical research, especially as it pertains to the use of vitamins and minerals, knows that such a conclusion (“the case is closed”) is as arrogant as it is absurd. In fact, the editorial doesn’t even do justice to the data presented in the three papers published within the same issue- let alone the broader evidence used to support the use of certain vitamins and minerals for the prevention of chronic disease. Let us briefly discuss the 3 papers published in this particular Annals issue- before moving on to the broader context that may expose the real issue behind this editorial. They included  the vitamin-only and placebo-only arms of the TACT (Trial to Assess Chelation Therapy), looking for reduced event rates after an initial myocardial infarction,  an attempt to see measurable cognitive changes when giving men a multivitamin- part of the Physicians Health Study II, and  a systematic review of a select group of studies using various vitamin preparations for primary prevention of cardiovascular disease and cancer- a review prepared for the U.S. preventative Services Task Force. 1. We have previously discussed the initial data from the TACT trial [here]- which showed statistically lower events when patients were given EDTA chelation, compared to placebo. Since this study was a 2×2 factorial trial- the two arms receiving no EDTA chelation (i.v. saline/placebo) given either placebo capsules or high-dose multivitamin capsules were compared in this study. A high-dose vitamin supplement, similar to those sold by a number of physician-only product companies, was used for this study. Patients were at least 50 years old and all had sustained a previous myocardial infarction. The primary end-point was a composite of time to death from any cause, re-infarction, stroke, coronary revascularization or hospitalization for angina. A secondary end-point using just cardiovascular death, re-infarction and stroke was also assessed. According to the authors, the high-dose vitamins showed an 11% relative reduction in the primary end point compared to placebo, but this difference did not reach statistical significance (see the cumulative events recorded over 60 months in the primary (top) and secondary (bottom) outcomes in the adjacent figure). 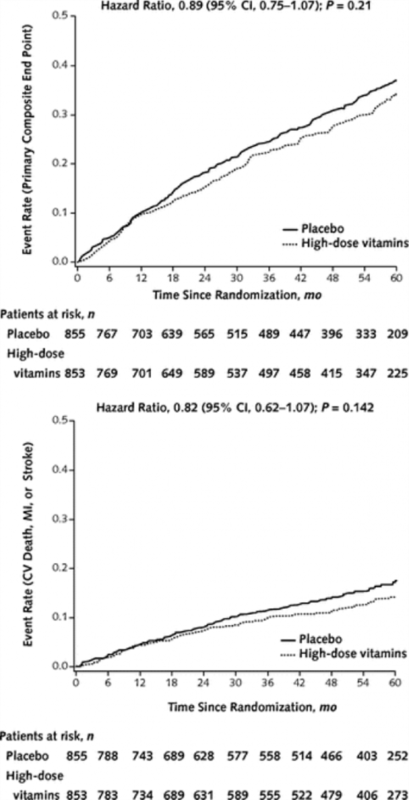 The authors make it clear to us that while the trial does not support the routine use of high-dose oral multivitamin regimen for all patients who have had an MI, the total number of events were smaller than the trial was originally powered to detect and thus -“ the reduced statistical power due to a small difference between groups, as well as the nonadherance to the study regimen, limits the conclusion of nonefficacy.” [emphasis added]. The number of people who stopped their vitamin or placebo therapy was staggeringly high at 46%. Let us now review a few more things that might be of interest to you- but left out of the editorial. First is the fact that both the vitamin group and the placebo group were consuming a high number of pharmaceutical agents (as one might expect of a post-infarct cohort). Subjects were on aspirin (>82% of subjects), beta-blockers (70%), statins (70%), ACEi/ARB (60%), Clopidogrel (25%), and oral hypoglycemic (>20%). On top of this- nearly half the patients were taking other multivitamin supplements! So, in essence, this study was looking for a statistical difference between one group of subjects taking high-dose vitamins (46% of whom discontinued taking them) and another group of subjects (half of whom were consuming another multivitamin of unknown ingredients)- while both groups consumed high amount of pharmaceuticals which are known to reduce both the primary and secondary end-points measured. Furthermore, there was one important cohort that realized a statistically significant reduction in the primary end-point when given the multivitamins; those individuals not on a statin drug (38% reduction in events p=0.012). So when we remove the effect of statins on these subjects- we see a strong benefit of the supplemental nutrients (these authors go on to tell to ignore these results, though they are both clinically and statistically significant, until more studies can be done). A very strong trend also existed in patients enrolled less than 5 years since their MI (p=0.046), suggesting that these nutrients are less effective the longer an individual has been pharmacologically-treated since their MI. Finally- while this study used a supplement containing much higher doses than nearly any other multivitamin trial to date- it is important to note that, unlike the widely repeated concerns of risk, this trial reported no difference in severe adverse events or incident cases of cancer. The limitations of this study are many. First, because this was a sub-study of the PHS2, the first (baseline) cognitive test began an average of 2.5 years after patients were randomized to their multivitamin or placebo. This means that the baseline could have been already influenced by years of the therapy. Even though their baseline data showed no statistical, between group differences, this fact alone would likely prevent anyone from drawing firm conclusions from this data. On top of this, subjects in the PHS2 were only prevented from taking other multivitamins if those products contained more than the USRDA of vitamin E, vitamin C, B-carotene or vitamin A. Which means they could be consuming high levels of B-vitamins- known to lower homocysteine (a metabolite associated in some studies with cognitive risk), or any of a number of other supplements known to affect cognition (Ginkgo biloba, phosphotidylserine, omega-3 fatty acids, vinpocetine, etc.) without the knowledge of the researchers (up to 1/3 of subjects were taking other multivitamins in the PHS2). These gross oversights are due to the simple fact that the PHS2 was obviously not designed to answer whether daily multivitamin use affects cognitive function in healthy older physicians in the first place. Rather than attempt to parse the nuances of each selected study, a broader critique will be sufficient for this review. Blinded by their desire to debunk the use of “vitamins” and “minerals”- these reviewers ignore the fact that each nutrient has a completely different mechanism of action, therapeutic dose potential and historical data. Comparing studies where subjects consumed the hormone-like cholecalciferol, with studies using the water-soluble antioxidant ascorbic acid, merely because both are classified as “vitamins,” is absurd and unscientific. On top of that, they excluded from their analysis any studies that used doses higher than the upper tolerable limit set by the U.S. Food and Nutrition Board. This would exclude products with more than 4000IU vitamin D, 35 mg of niacin, 1 mg of folate, or 350 mg of magnesium- often exceeded in products known for their therapeutic benefit. Furthermore, since they excluded studies where subjects were nutrient deficient- this virtually eliminates the application of this data to “average” American- many of whom are deficient in more than one vital nutrient; which begs the question of this review’s intended application. The authors do admit that this review study design is used “primarily to evaluate drug therapy. The design might not be ideally suited to evaluate nutrients.” They also acknowledge that since subjects in the placebo arm of each of these studies are healthy and not known to have any nutrient deficiencies- they are, in fact, comparing subjects with “adequate” nutrient intake (placebo) versus those with higher than adequate nutrient intake (supplemented treatment). In many cases, the “placebo” group is not even prevented from taking other supplements; or are consuming higher amounts of nutrients than the researchers originally anticipated (they note, for instance, that Women in the WHI control group had twice the average calcium intake than the study design anticipated). In the end, this highly selected review of widely divergent low-dose studies (only a few which reflect “real-world” supplementation) adds little to the evaluation of the use of appropriately dosed nutrient supplements for reducing the risk of (i.e. preventing) chronic disease. A final perspective: I find it ironic that while the FDA demands that manufacturers of dietary supplements constantly reassure their customers that “these products are not intended to cure, treat or prevent any disease”- that this same statement (although almost certainly untrue) is somehow proof of no health benefit. What this statement, and these types of trials prove- is that, alas- nutrients are not drugs! Furthermore, the studies designed to “prove” drug efficacy are inadequate and inappropriate to evaluate the benefits of nutrients. What started out as “evidence-based medicine” has now morphed into “medicine-based evidence”- where drug companies set the rules and FDA gladly enforces them. And even though the $300 billion pharmaceutical industry is 10-times larger than the supplement industry (only ~40% of which is vitamins)- we are advised to “stop wasting our money” only on the latter. Thankfully, the American public knows better- even if they don’t have access to all the nuances uncovered here. For them, the case is also closed: and they are not going to wait for the paid researchers to finally figure it out. Lamas GA et al. Effect of disodium EDTA chelation regimen on cardiovascular events in patients with previous myocardial infarction: the TACT randomized trial. JAMA. 2013 Mar 27;309(12):1241-50. Gaziano JM, Sesso HD et al. Multivitamins in the prevention of cancer in men: the Physicians’ Health Study II randomized controlled trial. JAMA. 2012 Nov 14;308(18):1871-80. Posted in To the Point --- Our Blog.Tagged EDTA, multivitamins.